The way we approach personal grooming seems to change more and more with every passing year. Compared to the Victorian era, getting ready for the day is a piece of cake. However, some aspects of moving to a more casual model of dress has lost us some of the refinery that past generations viewed as commonplace. If you went to a barbershop years ago, it was normal practice for a scalp, neck, and shoulder massage to follow a shave and cut. Nowadays, we’re lucky if we get the haircut appointment at all, let alone the style we actually asked for. While we can’t ask our hairdressers to do something they’re not accustomed to, we can get the tools to have that experience ourselves. 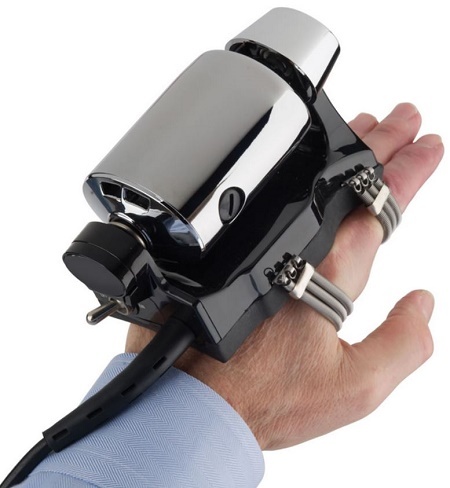 The Authentic Barbershop Vibration Massager is a device that goes on the back of your hand, and uses a 15-watt motor to vibrate 6 ball bearings laterally and vertically to give your hands a little extra oomph when giving a massage. This of course, has to be used by someone else on you for it to feel more effective on your head and shoulders, but can be used on your legs and arms. The massager has a rubber pad to ensure a good grip, and a chrome exterior on top. While the idea behind this is great, it doesn’t really seem worth the $169.95 to buy something that will make your hands vibrate. It would likely be better money spent on a full body massage.